On occasion we are asked about cleaning and ongoing maintenance of an aluminum enclosure. We and our customers want to keep our enclosures looking clean and new. Often, when someone asks about cleaning, it's related to a graffiti tag or perhaps grime and hand prints which were unavoidable as the enclosure was being assembled. Here you can learn about how to clean up the enclosure as well as how to maintain equipment enclosures over the years. 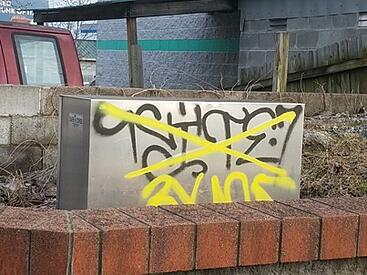 If your enclosure is a mill finish, aircraft paint remover will remove graffiti paint. Be sure to read the MSDS and instructions carefully before using the product. The best way to make sure you find the right product and find out where to buy it is to Google "aircraft paint remover". If the enclosure has a colored coating, first try water and a mild detergent. If this doesn’t remove the tag, it is smart to try the aircraft paint remover in an inconspicuous location to determine how it will react with the coating. It may be necessary to paint over the graffiti tag if the aircraft paint remover won’t work. Safe-T-Cover's equipment enclosures are shipped with a protective pvc protective film on each panel. We want to ensure that all the panels arrive and are installed clean and without scratches. Once the enclosure is assembled, the film can be removed. As we see new enclosures installed around the Nashville area, we've often noticed there is smudging and a large amount of fingerprints on the enclosure. This may hint the protective pvc film was removed before the enclosure was assembled. In this case, try water and a mild detergent to see if this will remove the smudging and hand prints. If not, an automotive cleaner or degreaser might work. First try this in an inconspicuous place to see how it reacts with the aluminum. Be sure to try a rag first and if you use a cleaning pads, make sure they will not scratch the surface. 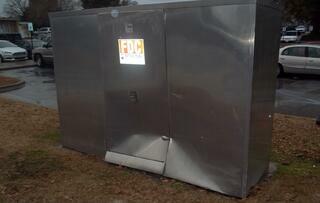 What happens if your aluminum enclosure is hit by a vehicle or a heavy tree limb falls on the enclosure? If your enclosure uses a modular design like Safe-T-Cover's panel design, all you have to do is get the serial number off the tag and call the manufacturer. For a small cost, a new panel can be made and shipped to your location. Remove the damaged panel and replace it with the new panel. If the enclosure is not a panel design, the entire enclosure may need to be replaced if damaged. Likewise if the enclosure has sprayed on insulation, you'll need to determine if the insulation is still in good condition throughout the enclosure. 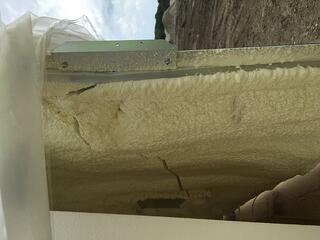 Safe-T-Cover's insulation is board insulation and comes installed in the panels. Aluminum enclosures require very little, if any, routine or ongoing maintenance. One item to consider when selecting an enclosure is the method of insulation as all enclosures are not made the same. Some enclosure manufacturers a use 1 ½” polyiso board for insulation. This insulation is mechanically fastened to the aluminum panels and will never come loose. Some manufacturers use a sprayed on insulation and can’t make the same claim as over time the insulation can break loose from contact when the enclosure is accessed for maintenance or testing of the equipment inside. It may even crack during shipment as seen in the image to the right. There are only a couple of ways we recommend you maintain your enclosure. Safe-T-Cover recommends a bead of caulk along the bottom of all panels except for the access panels and doors. This bead of caulk helps to keep the cold air out of the enclosure, helping any heating and insulation to maintain the correct temperature. However, the caulk can dry and crack over time and would need to be replaced as deemed necessary. One other item to add to the maintenance checklist is to check to operation of the thermostat and enclosure heater. You'll want to do this during the fall season before the cold weather arrives. Checking the operation before the cold weather season and making repairs as necessary should keep the equipment inside the enclosure from freezing. "An ounce of prevention," as the old saying goes. An aluminum enclosure should last many, many years. Some of our equipment enclosures have been in the field for more than 30 years. There are no moving parts and the materials are rugged and durable. You won't need to replace any materials due to rotting. Even if you order a colored enclosure, you won't need to paint every few years due to how our color is applied. No parts of the enclosure should wear out over time. If you check on the enclosure annually to ensure the heater and thermostat are working, and that the enclosure is staying insulated, you shouldn't have to worry about your equipment.